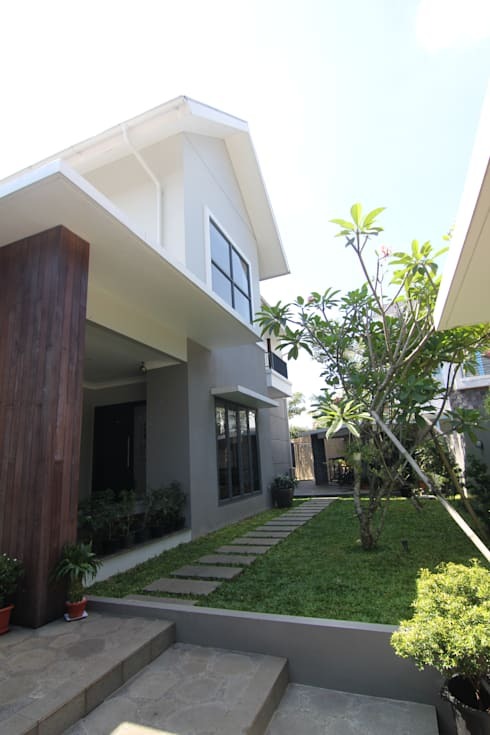 This two-story family house in Indonesia, built by the local architectural firm SONY ARCHITECT STUDIO, is a perfectly cozy and beautiful place for a medium sized family. The construction is carried out keeping in mind the family needs from the very beginning, so it has been possible to customize it perfectly as per the requirements. Normally you would not find two garages for a home that can house a medium family, but here several independent balconies, a large terrace, and a medium-sized garden with a swimming pool has all been taken care of. 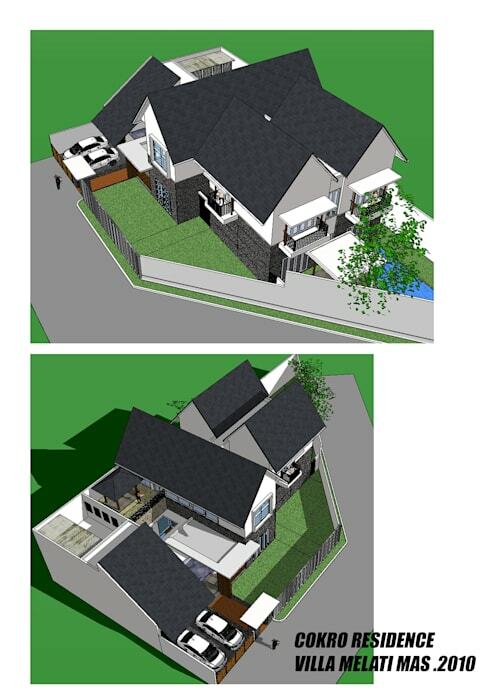 If you are also looking for some fashionable houses designed for families, then you are at the right place. A cemented ladder leads you from the gate to the door. Here you can see, part of the exterior walls are covered with outdoor planks and there is an open front yard to add a lot of natural look to the entrance. In addition, the front yard is also paved with a walkway made of square cement slabs, which is used to connect the front yard and back garden. This is a perfect place for the kids to play and enjoy fresh evening breeze. Want to refresh your front yard? Here are 15 small yard designs that you can copy. 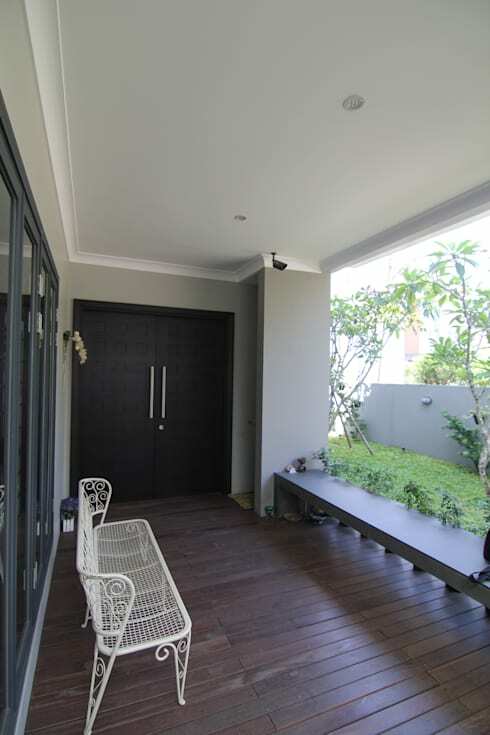 The wide and simple double-door design on the front made in wood all over, and the elegant wooden flooring make the entrance look natural and minimalist. The bench constructed in the front, is a wonderful idea for the entire family and friends to spend an evening out in the open. The white outdoor long chair that can easily have three people sit on it, is another lovely idea enjoy sitting outside. See 15 ideas to create an enchanting entrance to your home. The garden is elongated in shape, so designers worked with a rectangular pool. The overall design of the garden is simple and neat, with a touch of simple elegance. There is an outdoor seating next to the pool and a combination of wooden furniture and umbrellas makes it appear like a laid-back resort. You can also see the two different rooms on the second floor each having a small balcony. A great option for young couples, who can have their own independent space, even while living with a big family.Sounds interesting? The wall beside the pool is a concrete wall, providing good privacy, so even if you are enjoying a swimming pool party with your family and friends, you are not afraid of strangers in the street! The best part is that the swimming pool is so closely linked with the living room, that you just need to open the living room glass door and you are ready to jump into the water. Want to have a swimming pool in your garden too? Here are 9 pool alternatives, great for your garden. Another unique and special feature of this house is an indoor fish pond for Koi fish which is considered auspicious and has great ornamental value. 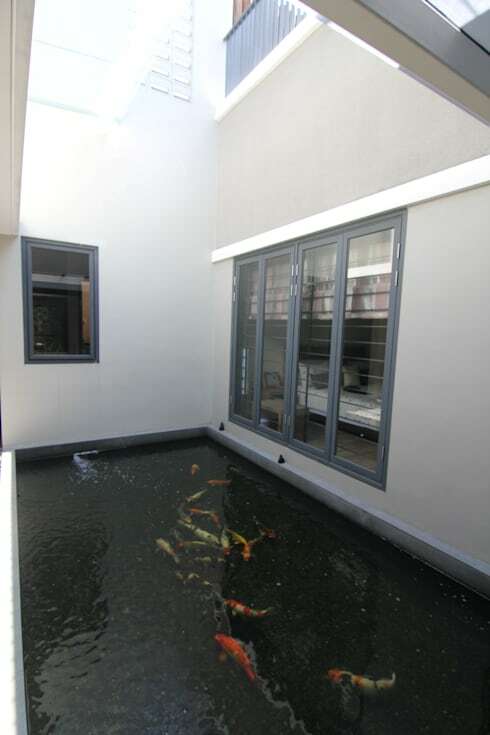 This pond is like other atrium gardens, introducing more natural light to the rest of the house, beside having a calming effect on the whole house atmosphere. The house boasts of a spacious living room that gives an additional rustic simplicity sense. The walls and floor in light shades of beige give a warm and cozy feeling to the atmosphere without being too bright. 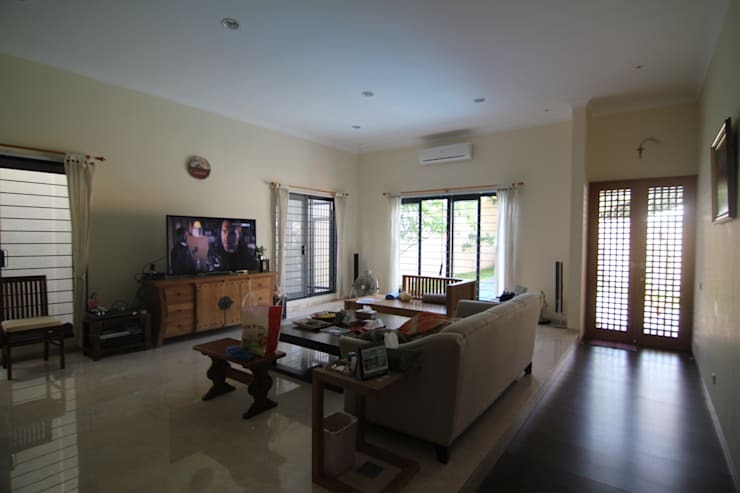 The living room has a lot of natural light, that adds to the freshness of the house. Love this minimalist living room, here is another beautiful living room with minimal furniture. This family villa has a variety of room types, and has a double-pitched roof that is common in contemporary wind design. The exterior color scheme of the house also follows the modern route, and the gray roof with a combination of white and gray walls looks very beautiful and peaceful. You can also see the parking lot, the terrace and garden and other parts of the lovely little bunglow. 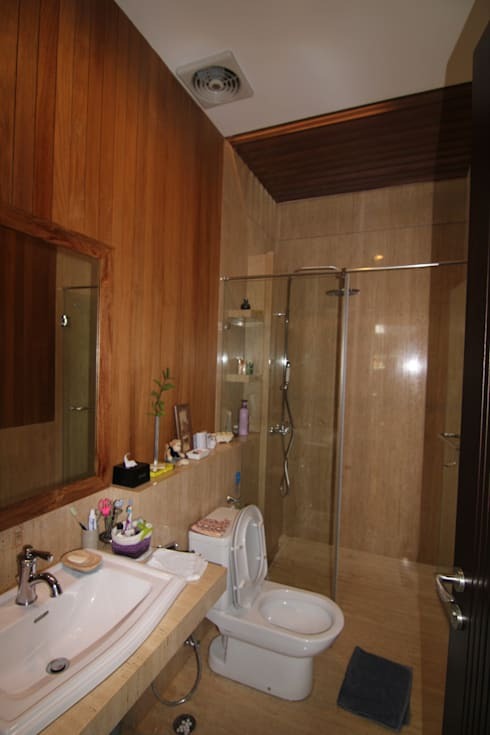 The shower area of the bathroom is covered with stone in earthen color. The wall over the hand sink and the ceiling of the shower are covered with waterproof wooden boards, adding some texture and depth to the bathroom. The counter top is again in earthen color, and the ultra white fittings make the bathroom look spacious. Looking for more inspiration. See 10 family sized houses, that you would love to call your home. 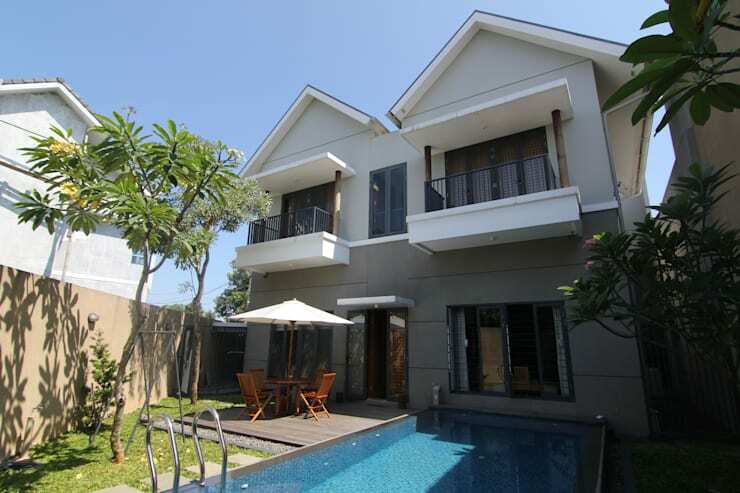 This beautiful family villa is just perfect for a small/medium family. Is there anything that inspired you?